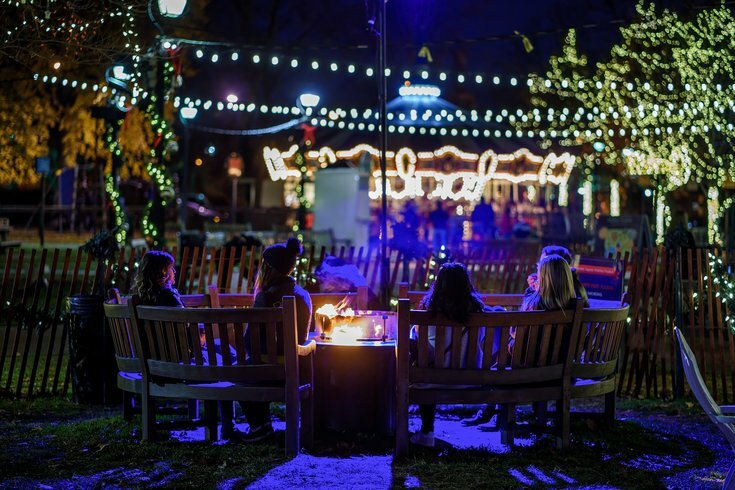 The beer garden at Franklin Square is a cozy spot to enjoy a drink with friends. It's the weekend before Thanksgiving and snow has arrived in Philly, along with excitement for the holiday season. If you're feeling festive, check out millions of lights (and Santa's reindeer!) at Elmwood Park Zoo after hours, or stop by LOVE Park for a preview of Christmas Village. Since it's only mid-November, the holiday market probably won't be as packed as later in the season. This weekend is also the Philadelphia Marathon, and we know all the good places to go after the race for food and drink deals. That's not all that's happening, though. A popular podcast is doing a live show at the Franklin Institute. Philly's own Chelsea Market is now open. And Franklin Square has a winter beer garden. The upscale food hall in Old City, similar to New York's Chelsea Market, is now officially open. There are 30 vendors inside the Bourse. Find everything from a raw bar to Indian street food to fancy grilled cheese sandwiches. Some of the vendors also sell alcohol. Time to celebrate the newest vintage from France's Beaujolais region. On the third Thursday of November each year, the red wine is released to the world. We found six establishments in the city serving Beaujolais Nouveau – a few are offering complimentary tastes. Thursday evening, opening night of Franklin Square's holiday season will take place rain or shine. The first Electrical Spectacle Light Show will begin at 5 p.m. Watch as more than 75,000 lights illuminate the park. Through the winter, the light show will take place multiple times nightly. There's also a beer garden with cozy fire pits and a heated tent with gourmet hot chocolate at the park. Toys for Tots distributes toys to less-fortunate children at Christmas. Friday night, you can give to the organization while sipping on festive drinks. Tickets are only $5. The award-winning podcast about the science and history of food is doing a live show in Philly on Friday night. Instead of just being hungry listeners, live show guests will get to taste the food Graber and Twilley are talking about on Gastropod. If you've never listened before, "Breakfast of Champions" is a good place to start. Montgomery County's new holiday attraction is a dazzling wonderland with millions of lights. Visitors can take photos with Santa and his reindeer, go nighttime zip lining and check out the exhibits of nocturnal animals. It will open Friday with a special appearance by Philadelphia Eagles' Fletcher Cox. Friday, Santa will flip the switch to illuminate Bucks County's Peddler's Village with one million jewel-colored lights. After, attendees can check out beautifully decorated gingerbread houses, or start their Christmas shopping early. Peddler's Village boutiques will stay open late. Last year there wasn't Preview Weekend for Christmas Village, but it's back for 2018. Saturday and Sunday, the open-air German market at LOVE Park will be open. Browse the booths selling toys, gifts, ornaments and clothing, then grab something to eat and drink. The Made in Philadelphia Holiday Market, curated and organized by Christmas Village organizers, will also be open across the street at Dilworth Park. Race day is Sunday. Around 30,000 runners will run the 26.2-mile course through the city. If you're one of them, check out all the deals at local restaurants and bars available to you once you finish. Show your bib to get a discount on cheesesteaks, beer, brunch and more.